The cooking grid of 3/8" diameter stainless steel rods provides 538 square inches of working surface, and the warming rack adds 112 more. That's plenty of space, and the four burners provide 48.8K BTUs for thorough heating of the grid. Each burner can be individually lit and adjusted, preventing wasted fuel and giving better control of temperature zones. A 12K BTU side burner hidden in the end table can handle sauces, soups, or coffee. A rotissierie is available as an add-on, but neither that nor a smoker box is standard on this grill. With the small hood size, slow cooking is a little more dependable than in Weber larger versions of the Summit -- the smaller space still allows plenty of cooking room and controls the air flow issues, but for slow and even roasting, the rotissierie is still a better option. Weber's flavorizer system controls flare-ups by vaporizing dripping fat before it reaches the burner flames, cutting back on charring issues that can be troublesome with charcoal fired grills and poorly designed gas versions. Quality of the build is as good as with Weber's larger Summit grills -- this one carries the same good warranty and has just been scaled back a bit. 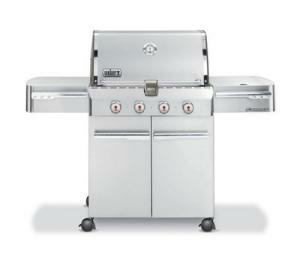 Be sure to get a grill cover for your Weber -- the stainless steel is rust-proof, but the cabinet is not rain-proof.